At Sunset Air Conditioning & Heating, we specialize in providing heat pump and air conditioner sales, installation, repair, and maintenance services in Cape Coral. We've sold and installed over 5,000 air conditioning systems for newly built homes and replaced thousands more for clients who wished to replace or upgrade an existing heat pump or air conditioning system. With our diverse selection of systems and superior level of expertise, Cape Coral homeowners can trust that they will get a high-quality central air conditioning system that is expertly sized and installed for optimal performance and energy efficiency -- all for one great price. Additionally, our highly trained technicians have the knowledge and skill to reliably diagnose, repair, and maintain all makes and models of air conditioners and heat pumps. Sunset Air Conditioning & Heating is an authorized dealer for several leading brands, including Trane, Rheem, Goodman, and Amana. By offering our Cape Coral clients a wide array of brand-name HVAC (heating, ventilation, and air conditioning) products, we are able to match each customer to a system that meets their specific cooling and ventilation needs as well as their budget. All of our air conditioning services are performed by highly experienced and qualified HVAC technicians. They follow the industry's best practices for repair, installation, and maintenance and apply quality workmanship to every job, no matter how big or small, for lasting results and complete customer satisfaction. Further ensuring that every job is done to the highest of standards is our owner, who has over 25 years of industry experience. He or one of his designated supervisors verifies that our work is done correctly and completely to code. For newly installed ac systems, they'll also come back one year later to check on its performance and verify that it is properly adjusted and still operating as the manufacturer designed it to. Call us today for a free over-the-phone estimate. About Sunset Air Conditioning & Heating: "Your Comfort Is Our #1 Priority!" At Sunset Air Conditioning & Heating, we're dedicated to customer satisfaction. We have built our business around quality service, integrity, and fair pricing. As a result, we have 1,000s of loyal customers and many more who continuously refer their friends, family, and associates to us. Our clients know that they can come to us for expert advice, a great value, and excellent customer service. Sunset Air Conditioning & Heating is fully insured and holds a state class-A contractor's license. We have over 20 years of experience and a team that excels in installing, replacing, repairing, and maintaining air conditioners and heat pumps. We're authorized dealers for Amana, Goodman, Rheem, and Trane, but we service all major brands. Because of our extensive knowledge, training, and skill, we are able to find our Cape Coral clients the most effective solution to meeting their indoor comfort needs at a price that fits their budget. Sunset Air Conditioning & Heating provides comprehensive AC installation packages for Cape Coral residents. These packages are a great value for anyone who wants to add central heating and air to their home, replace an existing system, or upgrade their equipment to a more energy-efficient, technologically advanced model. We carry the complete line of heat pumps and air conditioners from Trane, Amana, Goodman, Rheem, and Frigidaire, and offer some of the best prices around. Our comfort specialists will help you consider all your options and ensure that you get the air conditioner that is correctly sized for your home and level of usage. We offer Cape Coral A/C installation packages that range from economical to deluxe. 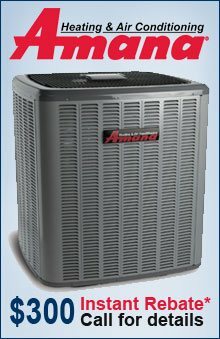 Typically, our standard packages include the air conditioner unit, humidistat, and thermostat; while the deluxe package features our top-of-the-line models, such as our 16 SEER Trane air conditioners with upgraded programmable thermostats, an ultraviolet light air purifier, surge protector, duct sanitation, and preventative maintenance. All AC installation packages include permits, labor, haulaway, and a courtesy check-up one year after installation. Each package is designed to give you everything you need to start enjoying a more comfortable home with improved energy savings, but can also be customized if you have specific needs or preferences. All our air conditioners are backed by Sunset's one-year labor warranty and the manufacturer's limited parts warranty. If you live in the Cape Coral area, call today for a free air conditioner installation consultation and over-the-phone or on-site quote. Rebates and financing with approved credit are also available. Sunset Air Conditioning & Heating is the contractor of choice when homeowners in Cape Coral require heat pump sales, installation, or replacement. That's because we've catered to the needs of residential heating and cooling clients for over 20 years and have an exceptional reputation throughout the local area. With our extensive training and focused experience, we can reliably determine which heat pump brand and model will best work for your particular needs and ensure that it is installed according to the manufacturer's guidelines for optimal performance, efficiency, and longevity. By having your home's heat pump installed or replaced by Sunset Air Conditioning & Heating, you can be sure that you are taking full advantage of the efficiency a new heat pump system has to offer. As part of every Cape Coral heat pump installation service, we will inspect the ductwork, verify that the heat pump has been sized correctly, and ensure that our clients take advantage of any available rebates. If you are interested in a new heat pump system or wish to switch from an air conditioner to a heat pump, call Sunset Air Conditioning & Heating today for a free consultation and quote. With their extensive training and years of experience, the team at Sunset Air Conditioning & Heating are experts at AC repair. Cape Coral residents can call us to diagnose and repair any AC make or model, including but not limited to Frigidaire, Trane, Bryant, American Standard, Day & Night, and Honeywell. We always do our best to accommodate emergency AC requests in Cape Coral as well as provide free over-the-phone troubleshooting help. For scheduled AC service in Cape Coral, you can expect our HVAC technician to arrive in a timely manner, ready to get the job done. We use state-of-the-art diagnostic equipment and apply the industry's leading repair and service techniques. Additionally, we keep our vehicles well stocked with replacement parts to resolve most repairs on the same visit. Call us today to tell us about your air conditioner or heat pump repair needs in Cape Coral. Our A+ rating with the Better Business Bureau is a testament to our honest business practices, and the superior customer care we offer. Preventative maintenance is key to keeping air conditioners and heat pumps functioning efficiently, smoothly, and reliably. For most residential air conditioning systems in Cape Coral, Sunset Air Conditioning recommends a tune-up be performed at least once a year, typically in the spring. Our 18-point AC tune-up prepares your system for the heavy demands of the hot summer months. This maintenance tune-up includes cleaning dirt and debris from the condenser; inspecting and cleaning air filters; deodorizing the air handler; checking electrical components, safety inspections, and more. For the best value in heat pump and air conditioner maintenance, Cape Coral customers can sign up for our service agreement, which includes a semi-annual AC tune-up along with additional benefits, such as same-day service and discounts on repairs. Call today to learn more about our preventative maintenance services or to schedule a heat pump or air conditioner tune-up in Cape Coral. At Sunset Air Conditioning & Heating, we help our Cape Coral clients save money on their monthly energy bills while maintaining or achieving the level of indoor comfort they require. One of the primary ways we do this is by educating our customers on how they can make small adjustments to their cooling routine for greater efficiency. Additionally, we recommend staying on top of air conditioning maintenance visits. With annual AC tune-ups, Cape Coral residents help their system run efficiently and catch problems before they potentially turn into more costly ones. Finally, we help our clients determine when their money's better spent on a new AC unit or repairs. Today's air conditioners are much more energy efficient, are backed by multi-year manufacturer warranties, and can qualify for substantial energy rebates, you could greatly reduce your cooling costs over the long term. Plus, Sunset Air Conditioning & Heating gives Cape Coral customers the best possible deals on brand-name air conditioning equipment and installation services. Call today to learn more.